This facial brush system keeps your face clean by keeping the brush clean, dry, and sanitized between uses. Powerful orbital brush action gives you a comfortable, deep cleanse. When you’re done, the brush sits in a rechargeable base that uses a halo of ultraviolet light to dry and sterilize. 99.9% of bacteria that could breed are banished—leaving the brush ready for your next round of facial care. Dimensions: 4" x 4" x 5"
TAO Clean is helping us take care of our face and our smile. Their rechargeable toothbrushes and facial brushes charge in an innovative base that keeps brushes clean and dry. Besides keeping your brushes powered up and ready to use, the base protects them from airborne particles (a particular concern for brushes you store in the bathroom). A halo of ultraviolet light surrounds the brush, eradicating up to 99.9% of germs. In order to further cut down on icky bacteria, the base helps dry your brush quickly—up to six times faster than similar sanitizers. Tao Clean stands for “The Art of” Clean, and their first product was the toothbrush sanitizing station. What prompted Founders Ryan Mongan and Simon Ghahary create it? Finding out that other toothbrush sanitizers don’t dry the bristles, which invites germs to stick around and breed. After the success of their sanitizing toothbrush station, Tao’s Founders realized that this same technology would work wonders for facial cleansing. 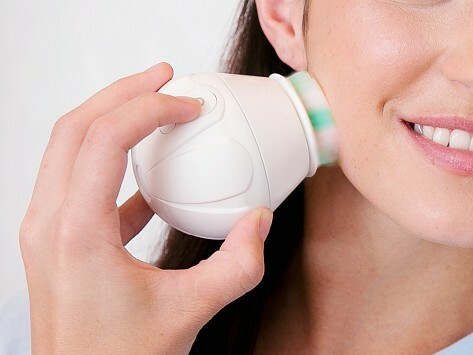 Their ultrasonic brushes remove dirt and makeup, and keep any extra acne-causing bacteria off the bristles. With these futuristic-looking sanitizing systems, you’ll stay cleaner and definitely have more reasons to smile.